I heart mason jar meals. They’re easy to prep, super portable, and fun to eat! Here are three of my current favorite wholesome jar recipes that I just had to share. I hope you enjoy them as much as I do! 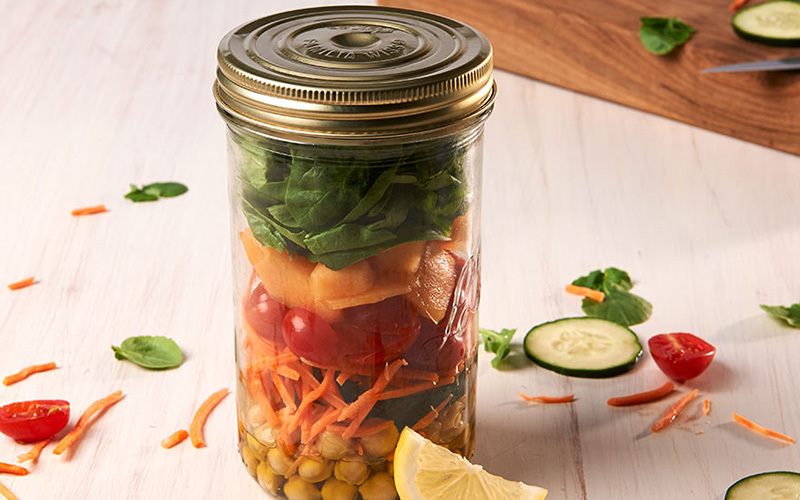 Make this nutrient-packed salad in advance for a grab-n-go lunch or whip up a bunch in jars for a unique BBQ or cookout presentation that’s as pretty as it is healthy. Whisk the ingredients in a bowl or shake them together in a dressing shaker. Pour desired amount of the dressing into a jar. Layer in the rest of the ingredients in this order: chickpeas, carrots, tomatoes, and cantaloupe. Top with spinach and watercress and screw on the lid. 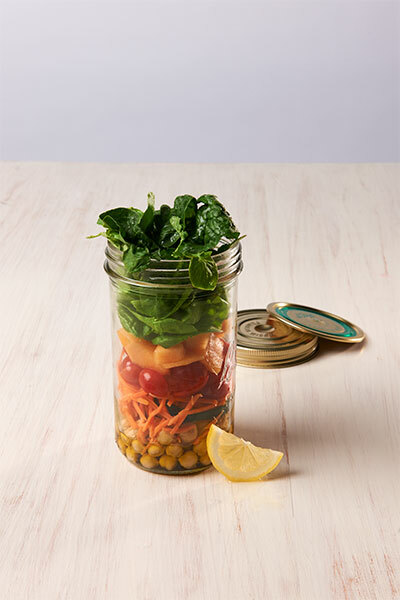 Tip: For any layer salad in a jar, begin with the dressing and then layer in ingredients from heartiest to least hearty. This keeps the salad from getting soggy. Health bonus: Watercress is packed with an abundance of essential vitamins and nutrients, including antioxidants and carotenoids. This recipe is fun to make as a kid’s snack, as an attractive dessert option at your next summer gathering, or when you’re simply craving a healthier cool-and-sweet treat! Coat the bottom of a jar with the chocolate syrup. Add the sprinkles and banana slices. Sprinkle the peanuts over the bananas. Scoop in the frozen yogurt and finish with the CocoWhip. 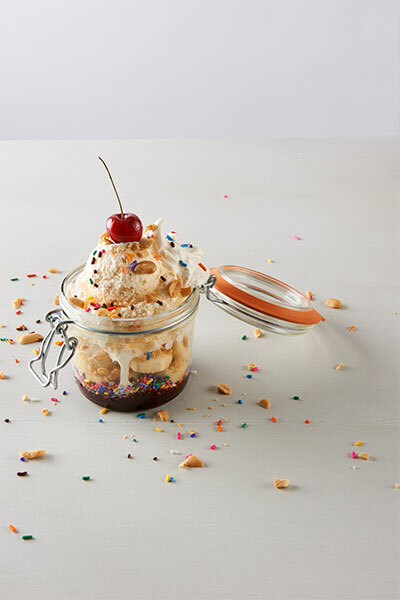 Garnish with a fresh cherry, more sprinkles, or peanuts! Perfect for those midday snack attacks! Stir together the nonfat yogurt and lemon juice. Add the dill and garlic powder and stir well until the dip is well blended. Spread the dip on the bottom of jar so it fills the jar to about ½ inch. 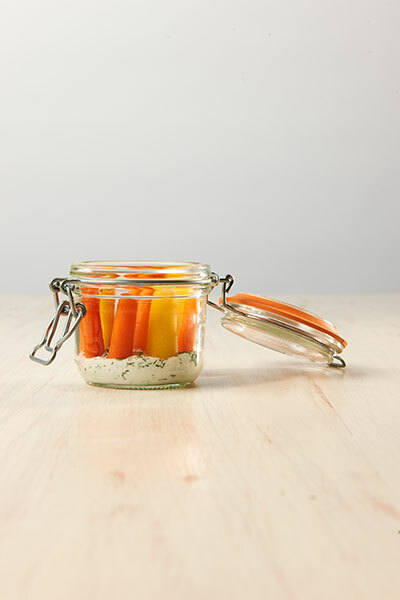 Place the baby carrots vertically in the jar. *Feel free to substitute with fresh celery slices or trimmed sugar snap peas! Note: As with any recipe, using organic ingredients for these jar meals will keep synthetic pesticides, herbicides, and insecticides out of your food and help to promote healthier soil and a healthier planet. 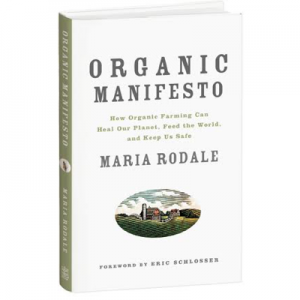 Carrie Mehl splits her time between being marketing manager for Rodale’s and snack/bulldozer expert for her 3-year-old son, Crew. She’s a creative enthusiast who’s energized by all things related to style, healthier eating, fitness, and overall good living. When the weekend arrives, it’s usually about traveling with her family to new places and spaces from the coast to the mountains. 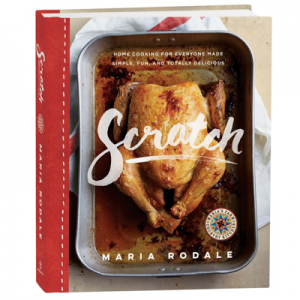 Maria, Enjoyed your recipes and article on depression. Your mother is right about the storm and rainbow.